We were treated to a little old-school horror story with this week’s episode: a bunch of friends in a remote cabin with a villain seeking revenge! I definitely got the shivers. Also on the menu: We finally got a Damon and Elena kiss (though their Facebook status is probably still “It’s Complicated”), and Caroline started to feel the Steroline love (she’s so jealous, you guys. Soooooo jealous). It may not shock you that all of this put me in a great mood. Let’s give some points! “These pecs are a plus.” Can that be the title of the group-written memoir by every male actor on TVD? Also, can we open every episode with a nice glamour shot of pectorals from now on? Nice way to ease in. Plus 15. This girl who I’m sure will die in two seconds and we’ll never see again was born to be Caroline’s best friend. Remember when she and Tyler were running away together and all she wanted was a curling iron? Plus 8. I still don’t get why Elena and Stefan are colluding to keep Enzo’s suicide a secret. Honesty is the best policy, people. Minus 20. Caroline’s dad’s cabin? What ever happened to the lake house? Did Elena burn that place down, too? Or maybe just too many Stelena-by-the-dock-wrapped-in-a-blanket memories? Minus 10. “I’ve had worse.” Stefan would probably win the “Whose Life Is Worse” contest every time, which would make this game super fun because he would be the drunkest. Minus 10. “For some reason, I thought that would feel better.” You’re the only one, Enzo. The rest of us are just unclear on why you’re still here. Minus 15. Elena, I love you, but … pigs would fly before Stefan Salvatore asked a lady to help him get firewood. Come up with a better lie next time. Minus 4. Is this how we play charades now? What happened to “favorite movies”? These poor kids, they had no childhoods. Minus 10. But it was great when Damon suggested a round of “never have I ever.” These guys are still, technically, teenagers. And when you put it like that, it’s pretty believable that they’ve all hooked up with one another. Plus 12. Caroline was unabashedly Team Stelena until about .5 seconds ago. I loved her little side eye and how she just couldn’t keep her mouth shut when she thought those two were using theirs. Plus 10. “Not to be the only girl here, but I can’t watch this.” I don’t blame Bonnie. So over watching people getting tortured. This is why I don’t have HBO. Minus 8. Yeah, I was more scared of Alaric-As-Klaus than I am of this guy. Minus 8 for Markos. The requisite Elena Gets Naked in Water With Ex Nearby scene. Sometimes I wonder what Nina Dobrev thinks when she has to look in the mirror during one of these. I hope it’s “I’d tap that.” Plus 20. When Stefan said “he was your friend,” did anyone else have a very visceral flash to Daniel Radcliffe in Harry Potter and the Prisoner of Azkaban, screaming “he was their friend!” on that rock? All right, just me, then. Plus 6. 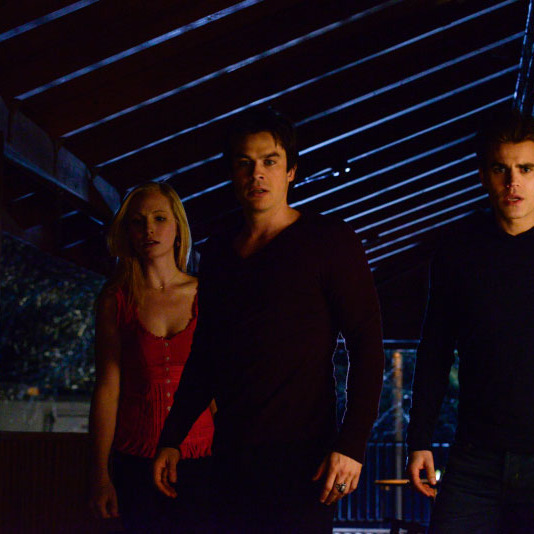 I am loving this episode, and the moment between Stefan and Damon in the burning shed is exactly why. No matter what shenanigans this show gets up to, at the core, we’re all team Salvatore. Plus 22. “My family’s all screwed up.” I want to know more about Luke! Why is his family messed up? Why does he want to stop the travelers? What happened to the guy who dumped him at Señor Frog’s? Minus 7 for lack of information. I freaked out for a bit when the travelers made Julian a permanent resident in Tyler’s body, but then I remembered nothing is permanent, everything is transient, this is a show about vampires. Plus 3. “There are things I tell you that I don’t tell her … I didn’t want you to think any less of me.” Look — I’m convinced we’re headed for a Steroline romance, but in the event I am wrong, this friendship is pure and true in a way that rivals most TV BFF pairings. They make each other better, stronger — support one another, protect each other, and are honest with each other (even about the shmutz on their cheeks). Plus 30. “Being around you drives me nuts and not being around you drives me nuts!” Well, you’re both driving us nuts, but you clearly stopped caring about that two seasons ago. No points. I don’t even know what they’d be for anymore. Then Damon kissed Elena. “I’ve had a really crappy day. And I needed it.” This is what we say about nachos, but fair enough. Plus 20. Here’s the issue with Damon and Elena: There is no issue. I know, right? After years of convincing (?) all of you to side with Team Stelena, I no longer want that. Is Stefan better for Elena? Probably. But who cares because you know who is definitely better for Stefan? Caroline. I think it’s time for Delena to just be together, or move the hell on. I think they know it, too, and that’s what is keeping them apart. Sometimes realizing there are ZERO obstacles in your way: no unresolved issues with ex-boyfriends, no sire bonds, no doppelgänger prophecies, is the hardest part. Because then happiness becomes a choice. And when happiness is a choice, it’s on you, not the universe. No points, just facts. I mean, getting kidnapped by the travelers is KIND of an obstacle. Minus 15. We’re in the green again this week, but I’m (finally) getting a little worried about the travelers. They have Stefan and Elena now — but more important, they have their blood. We’re getting close to the end of the season, so our gang better come up with a plan, and fast. As always, if you want to write fan fiction for Steroline’s first kiss, I’m here.